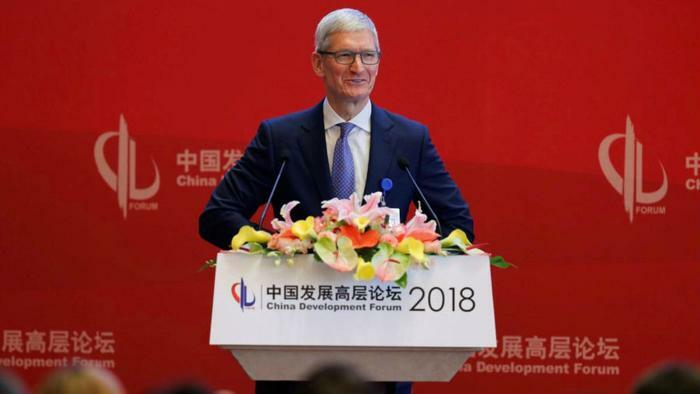 At the annual China Development Forum in Beijing on Saturday, Apple CEO Tim Cook called for stronger data privacy regulations to prevent “dire” situations like the leak of Facebook user information from happening again. Last week, news surfaced that Facebook let Cambridge Analytica harvest data on 50 million users without their consent in an effort to target messages to voters during the 2016 presidential election. To protect users’ data, Cook said tech companies need "well-crafted" data privacy regulations. Cook said Apple has worried for years that something like the recent Facebook data leak might happen. "Unfortunately that prediction has come true more than once," he said. “We’ve worried for a number of years that people in many countries were giving up data probably without knowing fully what they were doing and that these detailed profiles that were being built of them, that one day something would occur and people would be incredibly offended by what had been done without them being aware of it,” he said. Cook isn’t the first to suggest that tech companies need to be better regulated. Earlier this month, internet creator Tim Berners-Lee commemorated the 29th birthday of the internet with an open letter. In the letter, he urged for more regulation of big tech platforms. “Platform power” has made it possible for people to “weaponize the web at scale,” he said. “In recent years, we’ve seen conspiracy theories trend on social media platforms, fake Twitter and Facebook accounts stoke social tensions, external actors interfere in elections, and criminals steal troves of personal data,” he writes. To help solve the problem, Berners-Lee called for socially-minded regulation. "A legal or regulatory framework that accounts for social objectives may help ease...tensions," he wrote. "Today’s powerful digital economy calls for strong standards that balance the interests of both companies and online citizens."